Scanning two axis (tip-tilt) MEMS mirror (or "micromirror") is an optical beam-steering (or 2D optical scanning) technology that is used in many industries. There are several major benefits of the Mirrorcle Technologies Inc. tip-tilt MEMS mirror over competing products. 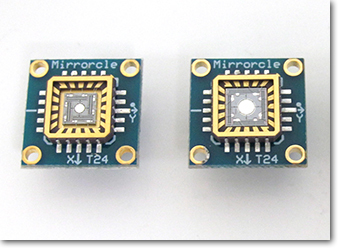 Gimbal-less Two-Axis Scanning Micromirror Devices based on ARI-MEMS fabrication technology initially developed through research projects at the Adriatic Research Institute (“ARI”) in Berkeley, CA, provide ultra low-power and very fast optical beam scanning in two-axes. The devices deflect laser beams to optical scanning angles of up to 30° at high speeds in both axes. Compared to the large-scale galvanometer optical scanners, our devices require several orders of magnitude less driving power. Continuous full-speed operation of our electro-static actuators dissipates less than a few milliwatts of power. MirrorcleTech's MEMS micromirror technology is highly versatile and adaptable to various applications. Some devices are fabricated with somewhat generic quasi-static (point-to-point) performance specifications. Other devices are highly customizable to achieve specific set of specifications, such as e.g. projection-displays. While the descriptions below mainly pertain to dual-axis devices, there are also multiple single-axis designs available, both point-to-point (quasi-static) and resonant type. The tilt angle is analog as opposed to on-off. See video of tip-tilt-piston movement under microscope. In order to produce devices with a different mirror size, most technologies require not only a new fabrication cycle, but in some cases complete actuator redesign. 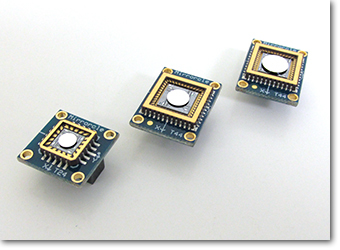 Mirrorcle Technologies is the world's only provider of a MEMS based, customizable aperture size beam steering technology. Namely, sets of electrostatic actuators optimized for speed, angle, area footprint or resonant driving are designed and realized in a self-aligned silicon fabrication process. Metallized, ultra low-inertia single crystal mirrors made stiff and flat by a special design of silicon beams are created in a separate fabrication process. The diameter, as well as geometry of the mirror is selected specific to a given application, in order to optimize the trade-offs between speed, beam size, and scan angle. The mirrors are subsequently bonded to the actuators. · Mirror Sizes: 0.8 mm, 1.2mm, 1.6mm, 2.0mm, and 2.4mm diameter in stock. · Maximum tilt angle under point-to-point driving: -6° to +6° mechanical each axis, varies with design type. · Single-Axis Option: Most designs can be provided arranged for pure single-axis motion. · Bonded Mirror Sizes: 2.0, 2.4, 3.0, 3.6, 4.2, 4.6mm, and 5.0mm, 6.4mm, and 7.5mm diameter in stock. · Maximum tilt angle under point-to-point driving: -6° to +6° mechanical on each axis, varies with design type, and in some cases is limited by mirror size. · Maximum tilt angle under resonant driving: -7° to +7° mechanical, in some cases limited by mirror size. · Single-Axis Option: In-stock single-axis actuators can be combined with many of the available mirror sizes. Optical Window: Anti-reflection coated fused silica windows. Removable. See support page for coating choices. Optical power handling: up to 2W any mirror, any wavelength. Above 2W depends on mirror size, coating, and wavelength. E.g. 3W CW blue or green on a 2mm or larger mirror . If you have questions or suggestions relating to this webpage, please email to webmaster@mirrorcletech.com. © 2005-2018 Mirrorcle Technologies, Inc. All rights reserved.